Ryan Robbins scored a last-minute winner for Stamford AFC at Bedworth. Stamford AFC manager Graham Drury is not thinking about how close his side are to making a piece of club history in the FA Cup, despite them ebing just two wins away from the first round proper. The Daniels reached the equivalent of the first round more than 100 years ago when there were fewer rounds in the competition, but they’ve never officially been in a draw alongside Football League clubs. Spalding United celebrate their second goal in a 3-1 win over Rugby. Photo: Tim Wilson. Tomorrow (October 1), Drury’s side travel to Northern Counties East League Premier Division side AFC Mansfield, who play a level lower than the Daniels, in the third round of qualifying for the historic trophy. Drury is not taking Mansfield lightly. He said: “They are a very expensively assembled side. Stamford beat Bedworth United 3-2 in the Evo-Stik NPL First Division South on Tuesday, scoring in the 92nd minute through Ryan Robbins, adding to goals from Lee Beeson and Ollie Brown-Hill. Striker Avelino Vieira is staying at Peterborough Sports. That was just a second win for Daniels who can see local rival Spalding United disappearing into the distance at the top of the table. Tulips are four points clear after scoring twice late on to beat bottom club Rugby 3-1 at the Sir Halley Stewart Field on Tuesday with goals from Cenk Acer, Brad Wells and Rees Longville-Daley. Spalding are set to sign striker Sam Mulready from Stamford, a fact that has not gone down well with Drury. Spalding travel to mid-table Chasetown tomorrow. 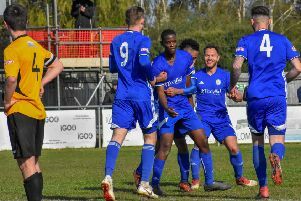 United Counties Premier Division leaders Peterborough Sports host Leicester Nirvana at PSL (3pm) boosted by the decision of star striker Avelino Vieira to rebuff a transfer approach from higher-level St Neots. Second-placed Holbeach United, who are three points behind Sports, entertain Desborough. Wellingborough Town v Wisbech Town. Bourne Town v Rushden and Higham United. March Town v Cornard United. Wisbech St Mary v Braintree.